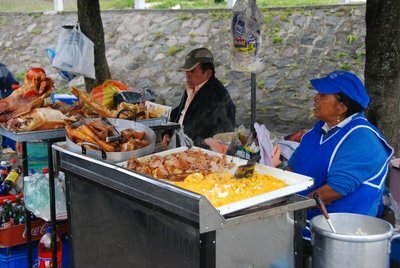 We left the hotel at 7:30am for the hour plus trip to the new Quito airport - that trip can be up to 2 hours in traffic. Most of the locals are too enthralled by the new location, although the new airport was quite nice. We boarded our AirGal charter flight and about 2 hours later landed in Baltra in the Galapagos. The fight was a little bumpy but they actually served real food. I did make a tragic mistake in that I had ice in my coke and paid for it yesterday, as I succumbed to the standard malady suffered by those that drink water south of the boarder. At the Baltra airport, you are processed for entry into the national park. We then boarded a quick bus ride to the dock where we boarded our first Zodiac ride (of many) on the trip. A quick briefing on board lunch and then a short time to decompress before we did a drive by of the two Daphne Islands. I will be adding pictures when I can, but the internet access is a little shaky on, and was, in fact broken yesterday. As I said, I was down for the count yesterday, a product of Montezuma's Ecuadorian revenge, and didn't leave the ship. I did go the the Medical Facility for some anti-biotic and had a nice conversation with the Dr - a Ecuadorian and very pleasant. She is on board for a six week stint. Today we are at Floreana Island. We did a wet landing on the beach and then a mile walk which was highlighted by watching a Pacific Green Sea Turtle crawl back into the water after laying her eggs. This is hard work, and she had to stop every few 'steps' to take a rest. She made it easily though as they have done for millenniums. We arrived in Quito at about 11:00pm - pretty typical for flights to this wonderful city. The airport is brand new - having only been open a few weeks, but you could hardly tell it. The baggage delivery and customs process was seamless and we were on our transfer to the JW Marriott in no time - well orchestrated by Celebrity Cruises. Our keys were waiting at the hotel as well as a warm face towel and a glass of Mango/Tomato juice - an interesting combination that was better than you would think. 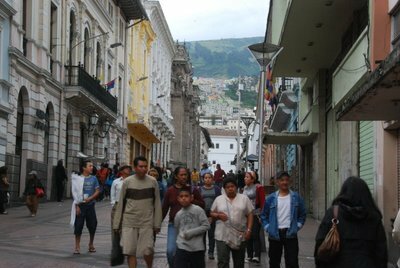 Quito is at 9300 feet above sea level - the second highest capital city in the world - and you could feel the effects coming off an airplane when you are somewhat dehydrated. I sucked down two waters from the time I got off the plane to the hotel - which is a little more than an hour away from the airport - the locals aren't that happy about it. We finally had relaxed enough by 2:00am to fall asleep. Celebrity had breakfast and a tour arranged for a 9:30am start. 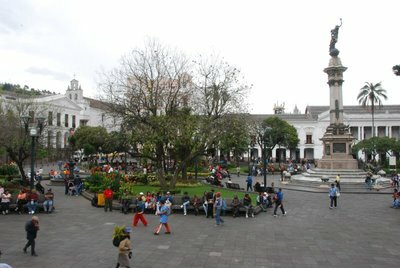 We didn't feel like a forced march bus trip at that hour, so I had arranged a private tour of Quito for four of us this afternoon - which meant we had a leisurely breakfast and some down time - which is what I do in most cities. Our guide Vivian, arrived promptly and she was one of the best folks that I have ever had on a tour. Conscientious and thorough we wandered through the maize of streets in Quito, visiting several of the spectacular church museums - La Iglesia de la Compania de Jesus and the Catedral Primada de Quito. 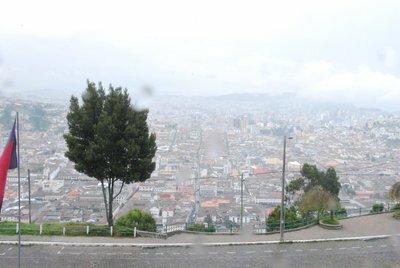 Quito has a ton of charm and history - I hope to come back again some time - it's a wonderful city. We are off tonight, compliments of Celebrity, to one of the top Italian restaurants in Quito, located in a beautiful manor in the city.